What's I-CAR Certification & Does it Matter? When you're looking for reliable auto body repair service, you might notice an I-CAR certification logo on some websites or in shop windows. This certification matters more than you might think. There are plenty of auto body and collision repair shops promising quality service, but that doesn't mean their technicians are properly trained or qualified to restore your vehicle's appearance and structural integrity. I-CAR certification is a quick and easy way for you to know that the person working on your car has the most up-to-date training and qualification available, so you can rest assured knowing the job will be done right. First established in 1979 as a continuing education resource for auto body repair technicians, the Inter-Industry Conference on Auto Collision Repair (I-CAR) has become the industry standard for excellence in the auto collision repair industry. 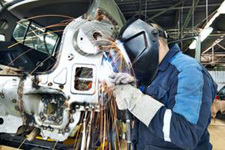 Our industry is constantly changing and evolving, and I-CAR's ongoing training programs make sure that repair technicians, shop owners, manufacturers and insurers are educated in the most current techniques and technologies while maintaining solid safety standards. Thus, I-CAR certification represents the highest level of skill, training, and excellence in this business. I-CAR provides certifications for both auto collision repair shops and for individual technicians, based on the level of training achieved. Individual technicians who have completed the highest levels of I-CAR training are designated Platinum certified. In order to maintain their Platinum status, these individuals must also take continuing education courses to keep current with the latest techniques and safety procedures. An auto body shop employing a minimum of four Platinum-certified technicians receives a “Gold Class Professional” certification—hence, the logo in the window or on the website. As you can see, I-CAR certification matters. It's not given out lightly, but has to be earned through rigorous training and maintained by holding to a certain standard of excellence. When you see the I-CAR logo, you know the auto body shop is well-versed in state-of-the-art techniques and fully qualified to restore your vehicle to prime condition. For the best quality auto collision repair and auto painting services in Mansfield, TX, Auto Tech Services (ATS) Collision Repair Center is proud to display the Gold Professional I-CAR certification, employing only I-CAR certified technicians. They have a 15-year track record of excellence in the Mansfield community, backing their work with a customer satisfaction guarantee. They can be reached for an auto body repair estimate at (817) 405-3444.